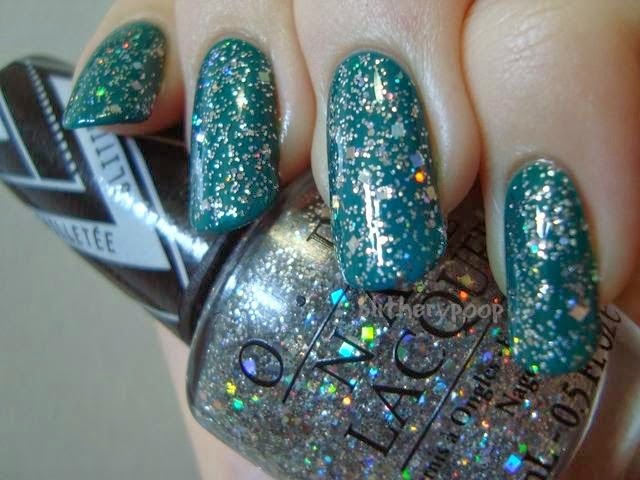 This is KleanColor Coastal Cruising over Zoya Cole. The file name I gave this combo is "pastelsatemybrain". Kinda says it all, no? I've shown this around a little and some people like it. Nichole is not one of those people. I don't think I am either. Pastels are all kinds of awkward for me and I'm not always able to tell what works and what doesn't. Coastal Crusing is cool though. It applies just like On-Off Relationship and Beyond Time & Space, so it requires dabbing and that makes the matte base sorta pointless. Still, it was dirt cheap and it's cool. I'm not griping. Next up is Sally Hansen Fa-la-la-lavender over Sinful Colors Violets Are Blue. This is too "un-me" for me to be able to tell if it looks good or not. I just know I don't really like it. Fa-la-la-lavender was actually from one of their holiday collections last year, but I think it fits better with spring colors. I got it for next to nothing at Target when it was still newish. Hooray for coupons. The application wasn't great. The base is a little watery and the glitter wants to huddle. I might purge this one. Milani Purple Martin is a medium purple cream. I wanted to love this one, but I don't. I searched for it, gave up, then suddenly encountered it at my favorite CVS at the very tail end of last summer. It was so late in the season that I didn't feel right wearing it until spring. Now that I have? Meh. There's nothing outright wrong with it, it just doesn't strike me. It doesn't help that it's completely impossible to photograph. This isn't a million miles off from right, but it definitely isn't right. It was a little closer as undies for Sally Hansen Take The Leap. The formula was just ok. It's got the slightest hint of shimmer, goes on thick, takes two coats for opacity, and had pinprick bubbles for me. Blah. This might also get purged. Can't love 'em all, right? 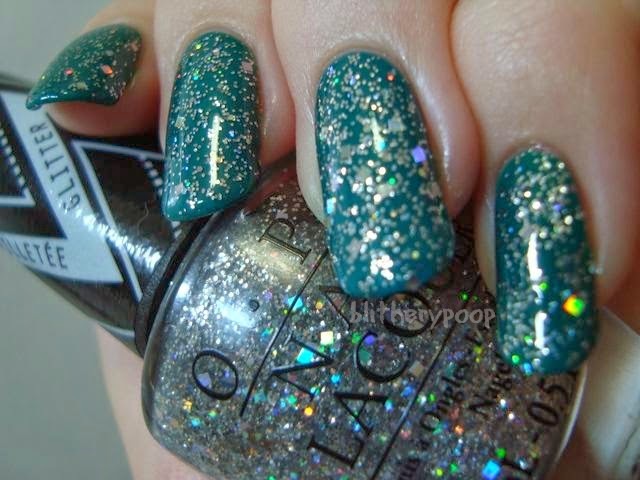 And finally, OPI Hey Baby over Amazon...Amazoff. In my post about the two Gwen Stefani satins, I mentioned that I'd have snapped up Hey Baby if the nail supply had it. Found it and I Sing In Color on my next trip! Woot! This is another I wanted to love. Nichole liked it. 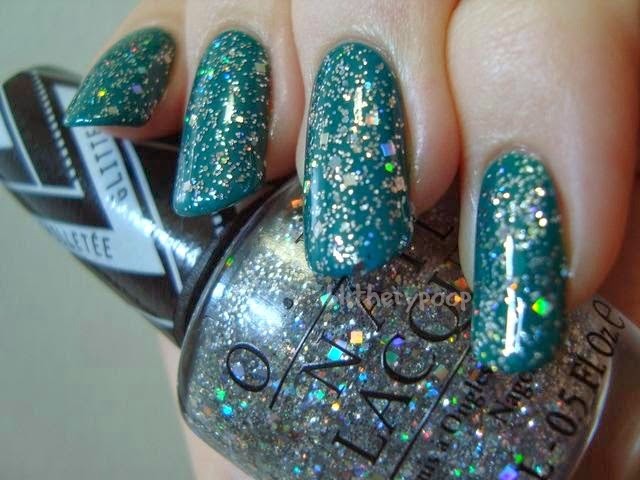 I do have a weakness for tiny square glitter, but something here just doesn't do it for me somehow. I think the glitter in this one might be too dense. I am so damn picky! I don't dislike it, but I might fight my fear of falling fill-lines and decant some to make a half-strength version. Nichole and I have never made a huge deal about our steadily rising post count. We usually just note it somewhere in a milestone post. This right here? Our 700th! I should wear Purple Martin again before purging it, but..it really left me flat. What about falalalavander over the milani one?